Every single day, thousands of elderly nursing home patients are subjected to disorienting and costly transfers to the Emergency Department for health challenges that could potentially be treated in place, if the resources were in place to do so. Nearly one out of every five ambulance transfers to the ED come from nursing homes. These are often chronically ill, medically complex patients with acute medical needs. The chaos of the ambulance trip causes additional mental and physical distress. They arrive at the hospital alone and are forced to bear the burden of interacting with a new set of “clinical strangers” who are unfamiliar with their symptoms. They’re often put in beds in the hallway and left alone. Frail, vulnerable, elderly patients are simply ignored. It doesn’t happen because clinicians don’t care or anyone wants these patients to be suffering the loneliness and isolation of the hallway ED, it happens because we have a system that’s broken. One area where politicians can and should be able to find common ground is value-based care arrangements, which have proven to be better for patient care and less costly for the healthcare system. This past year was a transformative one for healthcare. From big tech’s entrance into the field to the rise of virtual care to Congress warming to reimbursing innovative care delivery models, the healthcare industry has started to see some significant shifts in the space. The importance placed on value-based care has also been a major driver for industry change for patients, providers and payers. The opportunity to improve patient outcomes while decreasing cost will drive the industry forward and help reshape legacy practices. Providing comfort to those in extremis is among the most important things medical professionals can do in the field. Being with people at the moment of their greatest vulnerability and providing companionship, connection and support can be just as important as providing breathing treatments, fluids or antibiotics. This is especially true for patients in nursing homes, one of most vulnerable populations in the nation, but how can we make this type of care a priority to this demographic? In 2015, I cofounded Call9 after living in a nursing home for three months. I was 34 years old and wanted to understand this patient population and their experience so I could better serve them. Before then, I had been an Emergency Physician at Beth Israel Deaconess in Boston and time and again had cared for patients making seemingly avoidable visits to the Emergency Department (ED). If the facilities had the time, tools and technology to treat them in place, it would make for a more comfortable experience for the patient and would be more cost effective to the payer. There were three key takeaways from my experience. A telemedicine platform that provides real-time virtual care has helped a Long Island skilled nursing facility reduce hospital transfers, improve patient care and staff morale – and earn more than $150,000 in Medicare bonuses for the coming year. Can Telehealth Slow the Traffic Between Nursing Homes, Emergency Departments? There are 1.3 million transfers from skilled nursing facilities (SNFs) to emergency rooms each year, and CMS estimates that two-thirds of those are avoidable. The result is as much as $40 billion in unnecessary spending. Could telehealth be part of the solution? A telephone call out of the blue has helped 202-bed Central Island Healthcare slash its rehospitalization rate, capture about $150,000 in bonus government payments and earn a No. 1 rating among the nation’s 15,000 certified skilled nursing facilities. The secret ingredient for this metro New York provider? Embedded paramedics who connect with off-site, contracted physicians via telemedicine. McKnight’s Editor James M. Berklan spoke with CIH Executive Michael Ostreicher about the startling results. Today marks one of the most exciting milestones in the history of 20 Minute Fitness. We’re bringing you the very first episode of ‘Why I Built This’, a mini series introducing innovations that are revolutionizing the health & fitness industry and of course the master minds behind them. Though he's a doctor, Timothy Peck didn't know anything about nursing homes. So he decided to live in one and learn more as he started Call9, his company that uses technology to bring care to the bedside of nursing home patients. Call9 is a startup based in New York City. Its co-founder and CEO, Timothy Peck, is an emergency physician by training. While serving as chief resident in the emergency department at Beth Israel Deaconess, he noticed he and his colleagues weren’t able to deliver the best possible care to older patients. In a phone interview, Peck cited a statistic: 19 percent of ambulances that come to the emergency department originate from nursing homes and rehab centers. After these elderly patients arrive at the hospital, they often become delirious from the change in location and begin to feel sick. They then have to wait while physicians order tests to figure out what’s wrong. Overall, these avoidable ED trips are harmful to patients and costly to the healthcare system. Peck wanted to do something about it, but there was one major problem: He didn’t know anything about nursing homes. As a medical student, resident and doctor, Peck had “never once set foot in a nursing home,” he said. Thus, he endeavored to change that. Peck lived at a nursing home on Long Island for three months. During his time at Central Island Healthcare, he slept on a cot in a conference room and experienced the various elements of the facility, from seeing how the food was made to meeting with the CFO. While there, Peck also set up an experiment to see what the nursing home was like in the middle of the night. He set an alarm for 1 a.m. one night, 2 a.m. the next night and so on. Each time he got up and walked around, but never once did he see a physician. “You assume as a consumer … that there are physicians there, but there aren’t,” he said. That was the biggest lesson he learned from the experience. The knowledge gained from his time in the nursing home assisted him as he continued to build Call9. Here’s how the startup’s approach works: It places a first responder in nursing homes 24/7. They attend to the patient whenever there’s a change in his or her condition. The first responder can then use Call9’s technology to bring a remote doctor into the loop. The doctor can see, diagnose and treat patients, thus avoiding unnecessary ED trips. Peck said about 20 percent of the patients Call9 treats end up going to the ED, but the other 80 percent are able to stay in their own beds in the nursing home. The company participates in value-based arrangements with payers. It also contracts with nursing homes. “They pay us a platform fee for the utilization of some of our consulting services that are not covered by the payers themselves,” Peck said. New guidelines that could open up telehealth coverage under Medicare Advantage represent a serious opportunity for the industry, according to multiple technology providers — especially as the moves signal growing support for remote care from key federal officials. 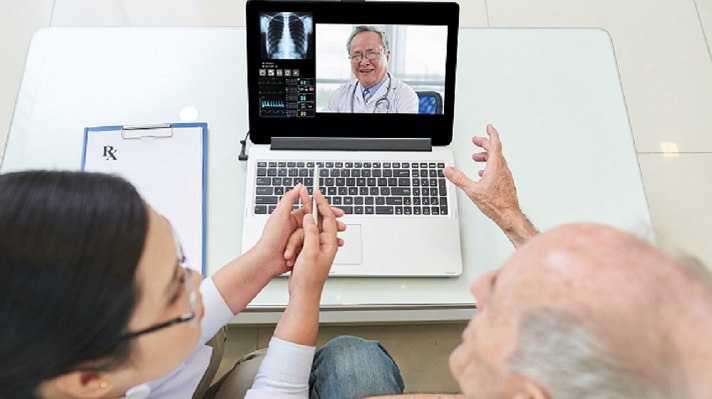 Under a proposed rule released late last month, the Centers for Medicare & Medicaid Services (CMS) would include telehealth services as part of the basic, core offerings for which Medicare Advantage plans can receive government reimbursements. The current structure forces Medicare Advantage plans to budget internally for telehealth services, according to Timothy Peck, co-founder and CEO of Call9, a platform that “embeds” emergency medical technicians in skilled nursing facilities and enables direct communication with remote doctors. So even if a plan determines that the use of Call9 or other telehealth technologies can produce savings in the short term, it’s forced to take on all of the financial risk. But the new rule, set to take effect in calendar year 2020, would provide for the direct reimbursement of telehealth services under Medicare Advantage regardless of location; currently, traditional Medicare only covers remote health tech in rural facilities. Central Island Healthcare now is able to regularly treat common ailments among residents such as hypertension, fever, chest pain and COPD in place, rather than sending patients to an emergency room. 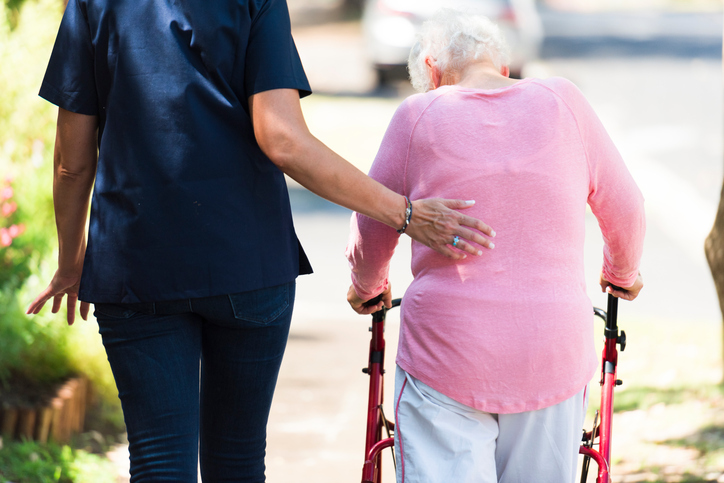 "All nursing homes are dealing with the challenge of trying to care for higher acuity patients with resources that are limited by the reimbursement we receive for care of their conditions," said Michael Ostreicher, executive director of Central Island Healthcare. "I had been thinking about ways in which we might provide that superior level of care and just as I was setting myself to solving this problem, I received an email from Call9 proposing the solution I'd been seeking," he said. Call9, a telemedicine vendor, proposed providing on-site emergency trained first responders 24/7 to Central Island Healthcare, said Ostreicher. The company works collaboratively with the nurses in the healthcare facility to provide an extra layer of support that's designed to allow on-site nurses to provide for the chronic care needs of patients. Those experiencing an acute change of condition are privy to Call9's services rather than having to be transferred to the emergency department – unless they're experiencing serious events such as strokes or cardiac arrest. In those cases, they're transferred, but with early intervention measures, offered via telemedicine, that help ensure better outcomes than they would have had without telemedicine. Central Island Healthcare, a skilled nursing facility in Plainview, New York, wanted to provide a superior level of care for residents in its facility who were being sent to the emergency department with conditions it believed it might be able to treat in place. Call9's technology and services would allow for improved coverage for Central Island Healthcare residents, which would result in better outcomes for them, less stress for their families and more resident days for the facility – all at a lower cost to the healthcare system, Ostreicher said. There are many vendors on the market today that offer telemedicine technology, including American Well, Avizia, GlobalMed, MDLive, Novotalk, SnapMD, Teladoc, TeleHealth Services, Tellus and Tyto Care. The telemedicine technology complements the workflows and abilities of Central Island Healthcare's team of nurses and caregivers, said Ostreicher. Call9's on-site team is part of the facility's care cooperative; the facility's team and residents are connected with them, and everyone works together to provide a comprehensive care solution when residents experience acute needs. "When a resident experiences an acute change of condition, our staff activate Call9, their clinical care specialist goes to the resident's bedside with a suite of diagnostics designed for acute care, huddles with our nurse, connects with a Call9 remote physician, and begins caring for the patient's needs via the direction of the doctor," Ostreicher explained. "We've seen a drastic reduction in hospital transfers as a result of this, and our residents experience a far greater quality of life because of it." The impact on patient care has been dramatic. In the four six-month periods prior to Call9's implementation, the healthcare organization was averaging 154 hospitalizations per period. In the four six-month periods after the implementation, the organization has averaged 85 hospitalizations per period. "With telemedicine, our patients are able to be seen by a physician within five minutes of identification of their acute change of condition – median time from activation – and the team is able to regularly treat common ailments among our residents, such as hypertension, fever, chest pain and COPD in our facility," Ostreicher said. Since implementation, Central Island Healthcare has seen a consistent 40-50 percent drop in emergency department transfers, a greater census of patients, and greater satisfaction among both residents and their families, he added. "The national paradigm of nursing home care is unsustainable," said Ostreicher . "It's both insufficient for the patient and more and more detrimental to the bottom line of facilities." Two months ago, Central Island Healthcare received the first value-based purchasing program reimbursement from CMS, he said – which more than covered the rollout of Call9 services, "without even considering all the other ways the telemedicine technology drove value to our facility." For nursing homes operating under the model of ten, or even five years ago, Ostreicher strongly encouraged them to identify and adjust to the shifting times: It's what's right for the patient and it will improve their bottom line, he said.